Scary Monsters magazine #37 - She Creature - Ghost of Dragstrip Hollow - Voodoo! 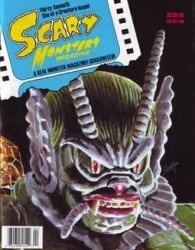 MyMovieMonsters.com > Scary Monsters Magazine > Scary Monsters 1-100 > Scary Monsters magazine #37 - She Creature - Ghost of Dragstrip Hollow - Voodoo! This is the Thirty-Seventh She of a Creature Issue of Scary Monsters, published in December 2000. Each copy is new, uncirculated.